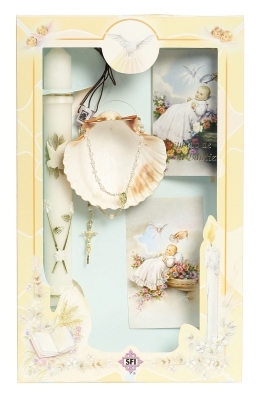 Such a precious gift set that includes everything you need for your little ones religious ceremony. This set is handcrafted and wonderfully decorated. Comes with everything that you see in set and packaged in a nice presentation box. Features: Decorated Candle, Gift Rosary, Remembrance Gift, Baptism, Handkerchief, and Nylon Scapular . Available for Boy of Girl in English or Spanish. This item is Final Sale.